When we think of Caesar, we usually think of Julius Caesar, the Roman emperor who was assassinated by his so-called friends. In the famous play by William Shakespeare, the back-stabbing Brutus proclaimed, “Let’s carve him as a dish fit for the gods.” The storied history of Caesar salad is nowhere near as gruesome or tragic, but it’s equally as enjoyable to consume. 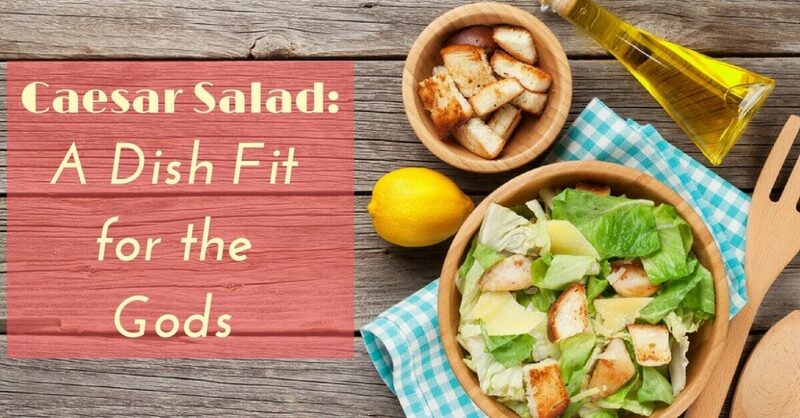 Let’s take a look at the history of this salad, a popular favorite on Italian menus worldwide. Caesar Cardini, the inventor of the famous Caesar salad, was an Italian American restauranteur and hotel owner. Cardini’s brothers emigrated to the US first; one moved to Santa Cruz, CA where he opened a small hotel near a casino, while the others got into the restaurant business in Mexico City. Caesar Cardini traveled as a steerage passenger aboard the RMS Olympic, and arrived in New York City on May 1, 1913. He traveled first to Montreal, and then around the US. Cardini returned briefly to Italy and studied European gastronomy, before returning to North America – this time, California. In both Sacramento and San Diego, Cardini ran a few restaurants, before moving to Tijuana, Mexico, where he established the first of several restaurants. Cardini made this choice because of Prohibition in the US, which outlawed the sale of alcohol. It was during this time that the history of salads was changed forever! The Caesar salad became so popular that it made its way overseas, introduced to Europe by Mrs. Wallis Simpson (also known as the Duchess of Windsor, married to the former King Edward VIII, who abdicated his throne). The Caesar salad was proclaimed to be “America’s greatest contribution to world cuisine” by a group of Paris’s leading chefs in 1953. Caesar salad also had a significant impact on agriculture in the US. Prior to the Caesar salad, romaine lettuce was not well-known among Americans; rather, iceberg lettuce was the popular choice. As of 2000, more than 80,000 acres are dedicated to growing romaine lettuce alone! Food trends come and go, but some which begin as a craze do have staying power. Such is the case with the Caesar salad. The Caesar salad has been subject to much controversy, with many people claiming ownership over its creation. The Chicago-based Italian chef Giacomo Junia, for example, claims that Cardini took the idea from his Sicilian waiter. Cardini’s own brother, Alessandro, claimed credit – except that he made it with anchovies, which is not a traditional ingredient in the original Caesar. Caesar Cardini moved his family to Los Angeles in 1938, and by 1948, he had trademarked his salad dressing. Rosa took over the business, Caesar Cardini Foods, Inc., which is now owned by T. Marzetti, a specialty salad dressing company. These days, you’ll find Cardini’s original recipe bottled up, alongside a dozen varieties of Caesar dressing. While Rosa Cardini frowns upon additions to the original Caesar, there are many common variations which include other kinds of lettuce (not romaine), grilled chicken or fish, capers, Romano cheese (rather than parmesan), anchovies, and bacon. Here at Cucina Toscana, we offer a traditional Caesar salad, prepared tableside in the fashion of Caesar Cardini. Start off your delectable Italian meal with a garlicky, creamy crunch of salad history!